Standing 18,510’ above the nearby Black and Caspian Seas, Russia’s Mt. Elbrus is Europe’s tallest mountain. 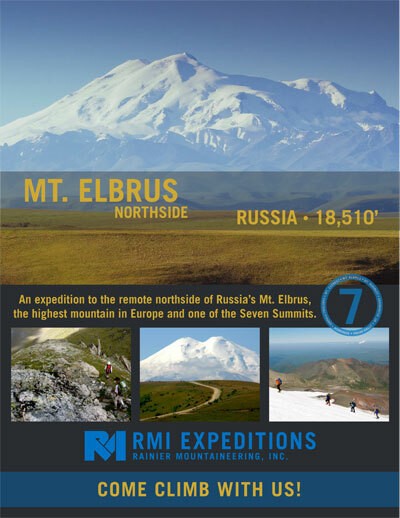 Our Elbrus North Side Expedition ascends a less traveled route on this popular mountain. Visit Moscow and stroll across Red Square to explore the courtyards and cathedrals of the Kremlin, after the climb wander through St. Petersburg’s Hermitage and many canals. Travel through the remote countryside of Russia's Caucasus Mountains to reach the foot of Europe's highest peak. Climb a less traveled route on Elbrus as we ascend one of the world's Seven Summits as part of a small, independent expedition. Learn the subtleties and tricks of expedition style climbing as we move our camps higher up the mountain in preparation for a summit bid. Take part in an RMI adventure and see why we continue to set the standard in guiding excellence. Standing in the heart of the rugged Caucasus Mountains, Mt. Elbrus rises impressively from the green plains that stretch northward into the heartland of Russia. RMI guides have been climbing Mt. Elbrus since the early 1990s and we have seen the mountain grow in popularity over the years. In our commitment to continually set the standard in mountain guiding excellence we are pleased to offer a climb of Mt. Elbrus' seldom visited North Side for a new, unique, and unmatched expedition to Europe’s highest point. Our adventures begin a thousand miles to the North of Mt. Elbrus in Moscow - the political, economic, and cultural heart of Russia - before we fly south to the town of Mineralnye Vody, the gateway of the Caucasus. The rising green foothills dotted with shepherds mounted on horseback give way to Mt. Elbrus, framed by the jagged peaks of the Caucasus. The route takes us from the mountain's base, sitting between ancient lava flows, up the rolling and rarely traveled glaciers of Mt. Elbrus' north side to the West Summit, the mountain's highest point. Simply reaching Base Camp gives climbers a rare glimpse of a part of Russia's countryside that has eluded the passage of time. The climb is a moderate snow climb, comparable in difficulty to the standard route. However, there are far fewer climbers on this route and it has a reputation of being a bit more adventurous. Due to the mountain's size and seclusion we climb "expedition style", acclimatizing as we move camps higher in preparation for the summit bid. Upon returning from our climb we fly to St. Petersburg. On the shores of the Gulf of Finland, St. Petersburg is often described as the "Venice of the North" with canals that weave between the city’s stunning architecture and famous museums that amazing works of art. Our time in St. Petersburg is the ideal way to end our Russian adventures. Rainier Mountaineering, Inc. was established in 1969 and is one of America's oldest and most-trusted guide services. We are the largest guide service on Mt. Rainier and Denali and leaders in guiding climbs and treks around the globe. Our years of leading mountain adventures give us the experience and knowledge to create the best possible trips. We work hard to live up to our reputation as an industry leader. As the only American guide service to regularly lead climbs of Mt. Elbrus' North Side, we are also one of very few expeditions to guide to Elbrus' West Summit from the North Side instead of the slightly lower East Summit. Our climb is led by our some of our top U.S. guides who bring years of international climbing experience to the expedition. We work closely with our Russian partner, a famous Soviet-era climber, to organize and coordinate the trip. Our relationships there are the key to our trip's success and scaling Mt. Elbrus' overlooked North Side with these climbing veterans' leadership and support is an unforgettable experience. RMI’s trip preparation before departure takes care of the details for you, from hotels and airport transfers to arranging in country flights, so that you can focus on preparing for the climb instead of the distractions that come with coordinating logistics. In Moscow and St. Petersburg we stay right in the center of the cities within a few minutes walking distance of the famous sites. While on the mountain we use RMI's own equipment brought from the U.S., ensuring that our expedition standards of quality, reliability, and comfort are met. The meals on the mountain are organized by our guides and cooked by them, keeping the team content, healthy, and strong throughout the climb. Our exceptional focus on detail, our unparalleled level of climber attention, and our genuine love of these adventures are what make our programs truly memorable. We also lead climbs of Mt. Elbrus' traditional route on the South Side of the mountain. This program is four days shorter and less technically and physically demanding than a North Side expedition as we use established huts on the mountain. Our Elbrus - South Side Climb is ideal for climbers looking for a slightly shorter climb or without expedition climbing experience. Safety has always been RMI's top priority and we strive to create the safest mountain experience possible. RMI's experienced team of guides focus on leading a fun and successful climb without compromising safety. We apply the same standards of safety we bring to Alaska and the Himalayas to our climbs of Mt. Elbrus. Careful planning, precise ascent profiles, flexibility in our itinerary, daily weather forecasts via satellite, and diligent attention are taken as we venture to high altitudes. Comprehensive medical kits, rescue gear, and communications equipment are carried with the group throughout the expedition. Base Camp is also equipped with medical and rescue gear. The experience of being out on the mountain, and the time built into the itinerary to sample a little of Russian culture (off the mountain). Obtaining the summit and descending in a safe manner. Depart U.S.A. Depending on flight times and connections travel to Moscow, Russia typically takes almost 24 hours from the U.S. Arrive in Moscow (SVO). A group transfer is arranged from the airport to our hotel at 4:00 p.m. If your flight arrives earlier in the day, after 3:00 p.m., or if you are arriving at a different airport you can hire a taxi or Uber to get to the hotel. Once we check-in to our hotel, the afternoon is free to rest and explore the city. A team orientation meeting is held at 7:00 p.m. We spend the night in Moscow at the Park Inn Sadu. Travel insurance is required for this trip. Due to the current political situation in Russia, we highly recommend you purchase insurance with “Cancel for Any Reason” coverage. Depending on the type of policy purchased you can protect against trip cancellation, interruption, delay, baggage loss or delay, medical expenses, medical evacuation, security and more. Travel insurance offers the best possible protection in the event of a sudden, unexpected illness or injury prior to or while traveling. Should you need to cancel from a program, Trip Insurance will refund you for any non-refundable cancellations fees when cancelling for a covered reason. Cancellation Insurance is included in the standard Trip Insurance policy if you are injured, or have a medical or family emergency prior to or while traveling. Should you need to cancel your program, Trip Insurance will refund you for any non-refundable cancellations fees when cancelling for a covered reason. Most travel insurance companies provide an option to include coverage that allows you to “Cancel for Any Reason”, but the initial policy must be purchased within 14 days of placing your deposit for the program. Cancel for Any Reason coverage will then protect you if you need to cancel due to a work or personal conflict, or change of mind. It will also protect you if RMI cancels the trip due to political instability or other situations that may undermine the safety and security of our climbers while traveling in Russia. Global Rescue is the world’s premier provider of medical and security advisory and evacuation services. Security Evacuation offers crisis evacuation services in non-medical situations. Examples include evacuations from areas affected by natural disasters, war or conflict zones, terrorism, and other areas in which participant security is threatened. Please confirm any current travel advisories/warnings as well as passport and visa requirements with the US Department of State. Travel to Moscow’s Sheremetyevo Airport (SVO) typically takes about 24 hours from the U.S. depending on your departure city, available connections, and flight times. Flights generally arrive in the afternoon on Day 2 of the itinerary. A group transfer is arranged from the airport to our hotel at 4:00 p.m. Departing flights from St. Petersburg (LED) may be booked for any time on the final day of the program. A valid passport is required when traveling to Russia. Your passport must be valid for 6 months beyond the expected return date. A Visa is also required for entry to Russia. This must be done prior to your arrival or you will not be permitted to enter the country. Our office will provide you with the current application form, a written itinerary and a letter of invitation from our hosting organization in Russia. You will need to submit these forms along with a valid passport, an additional passport photo and payment to your local Russian Consulate or a travel document company that can assist you in processing the Russian Visa. This generally takes place 2 - 3 months before the trip departure and will take 4 - 20 business days to process. Once your visa arrives, please check the date to ensure it covers your complete stay. Upon arrival proceed to the Immigrations desk for foreign travelers. Proceed to Baggage Claim and then to Customs. There will be a random selection of bags for inspection. Be sure to keep all your bags together. Our office will coordinate a group transfer from the airport to our hotel at 4:00 p.m. If your flight arrives earlier in the day, after 3:00 p.m., or if you are arriving at a different airport you can hire a taxi or Uber to get to the hotel. The provided transportation in Russia as stated in the itinerary is via private vehicle. For the most current information on inoculation requirements and recommendations, please refer to the Center for Disease Control and Prevention. Travelers often suffer from upset stomachs when in foreign countries. There are some basic rules, however, that can help keep you healthy. Hygiene - It is important that you wash your hands thoroughly before meals and after using any bathroom. If water is not available for washing, we recommend using a hand sanitizer. Water - The number one rule is: don't drink the water, and that includes shower water and ice! Brush your teeth with purified water rather than tap water. You should check bottled water for a good seal and use a napkin to wipe dry excess moisture in drinking glasses. Take care with fruit juice, particularly if it has been diluted with water. Carefully clean the tops of bottled beverages before opening. Food - If you can cook it, boil it, or peel it; you can usually eat it. Salads and fruits should be washed with purified water or peeled where possible. Be wary of ice cream and shellfish. Always avoid any undercooked meat. Elbrus is a remote mountain without easy access to definitive medical care. We are our own rescue team. The medical facilities in Moscow, St. Petersburg and other urban areas in Russia are limited except for routine, non-emergency needs. We will work with our tour operator to access an appropriate level of care should the need arise. Russia is the largest country in the world at almost twice the size of the United States. Officially known as the Russian Federation, its main attractions include art, magnificent (and newly restored) cathedrals and monasteries, treasures and palaces of the czars, the performing arts, health spas, river cruises, historic sites, spectacular scenery, Siberia, and Moscow's Kremlin. Russia has a captivating history. Tradition says the Viking Rurik came to Russia in 862 and founded the first Russian dynasty in Novgorod. Through the 10th and 11th centuries, Christianity united the various tribes, but Mongol raids broke the Russian territories into smaller dukedoms. It was Ivan the Terrible (1533-1584) who is credited with founding the Russian state. The succeeding period saw power wrested into the hands of the czars and expanded Russian territory. These actions ultimately led to revolution and the creation of the Soviet Union (U.S.S.R.) in 1922. The Union dissolved in 1991 and Russia became the federal presidential republic that it is today. Russia will appeal to travelers who have a sense of adventure and an open mind. Don't expect a relaxing vacation and, unless you're in Moscow or St. Petersburg, don't expect deluxe accommodations - a trip through Russia requires determination, flexibility and plenty of patience. The climbing season extends from May to September, with the highest summit success rate from mid-July through mid-August. September through April comprises the rainy and winter seasons. The weather in Moscow and while traveling to and from the mountains can be very warm. While there can be no guarantees of perfect weather in the mountains, our expeditions take full advantage of both the weather and route conditions for this expedition, and utilize prime months for optimal climbing experiences. Men shake hands when greeting one another and maintain direct eye contact. Women generally shake hands when meeting one another for the first time. In greetings between men and women, a light handshake is common. It is expected that you remove your gloves to shake hands, regardless of how cold it may be. The three alternating kisses used in greetings are common only between friends and family. Chivalry, for the most part, is still valued in Russia. Men are expected to hold the door, offer their seat, or offer their coat. Electricity in Russia is different than in the United States. Russia has standardized on type F (Gost) sockets and plugs. Type C plugs and power points are still commonly found in older buildings. Both are used for 230 volt, 50 hertz appliances. U.S. appliances will require plug adaptors, convertors or transformers. Remember to bring any necessary adaptors if you plan to recharge electronics. The current currency of Russia is the Ruble. Currency can be easily converted at banks, hotels and kiosks. Check a financial newspaper or www.xe.com for the current exchange rate prior to departure. We suggest bringing $600-$900 total for personal spending money including restaurant meals, drinks, pocket money, and the Support Staff Tip Pool. Cash machines are still the best way to get money in country, so if you are in doubt, be sure to bring your cash card. Cash machines are readily available in Moscow and St. Petersburg, but become increasingly difficult to find outside of the main urban areas. Credit cards are accepted in most, but not all, areas. Everyone approaches tipping a little differently. Whether or not a person tips, and how much, is completely dependent upon the individual; here are some suggested tipping guidelines for your trip. Local waiters, drivers, and other service personnel expect to be tipped. Ten to fifteen percent is standard. Some restaurants and hotels add a 10% service fee to bills in which case, no further tip is required. Support Staff Tip Pool: We recommend that each climber contribute $40 to the Tip Pool. This is collected at the beginning of the trip and will cover group tips for all our support and mountain staff throughout the program. Our guides work hard to ensure your well-being and success on the mountain. If you have a positive experience, gratuities are an excellent way to show your appreciation. Amounts are at your discretion and should be based on your level of enjoyment. Tips for excellent service normally average 10 – 15% of the cost of the program. If you would rather not bring the guide gratuity with you on the trip, you can send a check or call the RMI office to pay with a credit card upon your return. http://wikitravel.org/en/Russia and https://www.lonelyplanet.com/russia offer a wealth of information. This trip is open to all individuals in excellent physical condition and is a great first trip to altitudes above 15,000'. Prior knowledge of, and comfort with, rope travel, the use of crampons, and ice axe arrest are required. Our experience shows that individuals perform better and enjoy the adventure more if they have a high degree of fitness and comfort with basic mountaineering skills. This program’s high altitude and snowy terrain contribute to make this a very worthwhile challenge. Finally, physical performance and acclimatization are also related to how well you have taken care of yourself throughout the hours, days and weeks prior to summit day. Arriving healthy and well-rested, maintaining proper hydration and caloric intake, and protecting against unnecessary heat loss (staying warm) are all key factors in an individual’s success on an expedition such as this. A 120+ liter bag made of tough material with rugged zippers. A 90+ liter pack is the recommended size for this climb. Your pack must be large enough for your layers, climbing gear, and food, as well as a portion of your tent and group load (kitchen equipment). A separate summit pack isn't necessary. Full-length inflatable or closed cell pad. The length of your axe depends on your height. Use the following general mountaineering formula: up to 5'8", use a 65 cm axe; 5'8" to 6'2", use a 70 cm axe; and taller, use a 75 cm axe. If you hold the axe so that it hangs comfortably at your side, the spike of the axe should still be a few inches above the ground. We recommend a comfortable, adjustable alpine climbing harness. Removable, drop seat or adjustable leg loops are convenient for managing your clothing layers over the course of the climb and facilitate going to the bathroom. Used for clipping into the climbing rope. Used for pack ditch loop, etc. A UIAA (Union Internationale des Associations d’Alpinisme) or CE (European Committee for Standardization) certified climbing helmet. Bicycle or ski helmets are designed for a different type of impact and will not substitute as a climbing helmet. The 10 to 12 point adjustable crampons designed for general mountaineering are ideal. We highly recommend anti-bot plates to prevent snow from balling up underfoot. Rigid frame crampons designed for technical ice climbing are not recommended. A digital transceiver is preferred; analog will work as well. If you rent a transceiver, one set of new batteries will be provided. Wool or synthetic. It should provide warmth but also be thin enough to fit underneath a climbing helmet. Amber or rose-tinted goggles for adverse weather. On windy days, climbers, especially contact lens wearers, may find photochromatic lenses the most versatile in a variety of light conditions. A waterproof pant with 3/4 side zippers (sometimes called 7/8 or full side zips) are required for facilitating quick clothing adjustments over boots and crampons. Insulated double boots are the preferred choice. They provide the best insulation as well as a more rigid sole for kicking steps and holding crampons. Leather mountaineering boots that have completely rigid soles are also adequate, but they will need to be insulated and may still result in cold feet on summit days. Bring one pair of chemical foot warmers if you are using the leather mountaineering boots. We recommend a knee-length pair of gaiters, large enough to fit over your mountaineering boots. This will protect you from catching your crampon spikes on loose clothing. Chlorine Dioxide water purification drops. We do not recommend the tablets due to the extended wait time. We recommend lining your backpack with garbage bags to keep items in your backpack completely dry. Plastics made with high post-consumer recycled content are recommended. RMI provides the following equipment for your program: tents, group cooking equipment, climbing ropes, avalanche probes and shovels. On Mt. Elbrus North Side you will need 10 mountain lunches. All of your mountain lunch items should weigh 6 - 7 lb. Breakfast and dinner meals on the mountain are included as indicated in our Trip Itinerary. With the exception of hotel breakfasts, most restaurant meals are on your own. You are responsible for your own bottled water and drinks. Mountain lunches are eaten during short breaks throughout the day. We continually snack to keep our energy levels up while we climb - lunch begins just after breakfast and ends just before dinner! Avoid packing any items that require preparation or hot water. Recommended mountain lunch items: dry salami, smoked salmon, jerky (turkey, beef, fish), small cans of tuna fish, individually wrapped cheeses such as Laughing Cow or Baby Bell, crackers, bagels, candy bars, hard candies (Jolly Ranchers, Toffees, Life Savers), Gummy Bears, sour candies (Sweet Tarts), cookies, dried fruit, nuts, energy bars, GORP mixes, and drink mixes (Gatorade/Kool-Aid). We may have a chance to purchase additional food in Russia, but we recommend you take what you need and only supplement with local food if necessary. The breakfast menu includes items such as instant oatmeal, cold cereals (granola), breakfast bars, hot drinks (coffee, tea, cocoa, cider) and local fresh fruit. Dinner usually begins with soup and ends with dessert, followed by a round of hot drinks. Healthy one-pot meals, incorporating fresh local food whenever practical, are served as the main course. One typical main course dinner might be spaghetti with fresh vegetables. There are limitations, but the menu is planned to offer good variety and ample portions. Deposit Payments: A deposit payment of $1,250 per person secures your reservation. Deposit payments $2,500 or less may be made via MasterCard, Visa, e-check, check, or wire transfer. Deposit payments over $2,500 must be made via e-check, check, or wire transfer. The $1,250 per person deposit is non-refundable. Written notification is required for all cancellations. If you cancel 120 or more days before the start of your program, program fees will be refunded less the non-refundable $1,250 per person deposit. * Single Travelers: Accommodations are based on double occupancy. A Single Supplement Fee will be charged to those occupying single accommodations by choice or circumstance. The single supplement is not available in huts, tents, or in all hotels.